Review The future is here, or at least the next five years of it for Ubuntu fans. Canonical has released Ubuntu 14.04 Long-Term Support (LTS) release, meaning the Linux shop will be supporting this distro until 2019. Significantly, this is likely the first look that more conservative users will get at the direction Ubuntu has been pursuing since the release of 12.04 back in 2012. As I noted in the beta review, Ubuntu LTS releases understandably tend toward the conservative end of the spectrum when it comes to new features. You're not going to see Unity 8 in this release, nor will there be any trace of the Mir graphics stack which Canonical is hoping will one day support both its desktop and mobile offerings. However, for those who only upgrade when LTS releases come around, the picture is much different. The changes since 12.04 (the last LTS release) are significant and – apart from one major exception – very welcome. Ubuntu 14.04 is faster, more stable and overall much better than 12.04 and brings far too many updates to cover in full detail here. A few of the highlights include better support for high-resolution displays, TRIM for solid state drives is now turned on for Intel and Samsung SSDs, Nvidia Optimus support has been improved, and all of the default applications have been updated to their latest stable versions. For the major apps that means Firefox 28, LibreOffice 4.2.3 and Nautilus 3.10. Ubuntu 14.04 is using Linux kernel 3.13. Beyond the hardware support improvements and underlying app updates – which is perhaps most notable for the more conservative, LTS-updates-only crowd – is the news that 14.04 revives some long-missing features Canonical had removed from Unity. There doesn't seem to be a clear explanation for why Canonical has had a change of heart on these previously no-go user interface options, but with 14.04 you can now get menus in windows, minimize windows from the Unity Launcher, customize Launcher menus to suit your needs and even see the full suite of menu items in previously hobbled apps like the Nautilus file browser. Of these, the menu-in-the-windows option is perhaps the most significant. Of all the desktop paradigms Ubuntu upended with the launch of Unity, bumping menus to the top bar was perhaps the most confounding for long-time users, especially those coming to Linux from Windows. The justification for moving menus to the top of the screen has always been that it saved on vertical screen real estate. It's also more in line with Fitts' Law and, as an added bonus, mimics what you'll find in OS X, a platform noted for its usability and design. 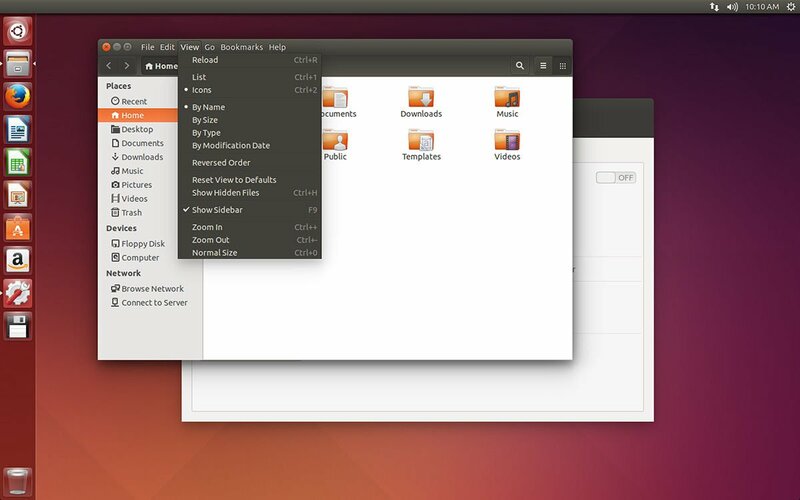 Ubuntu 14.04 adds back an option to have window level menus. There are two caveats, though. First, the defaults have not changed. If you want the new menus you'll need to head to the system settings and enable them yourself. Once you've done that you'll find that Canonical's decision on where to put the menus is a tad unusual: instead of adding the menu as a line of options below the window title bar the way you might expect, Ubuntu 14.04 packs them into the title bar itself to save space. The good news is that this in fact works quite well. Not only does it save a few pixels, it just feels less cluttered and more in line with the overall Ubuntu desktop design ethos.